To Help The Youngest Patients, A Hospital Invests In Affordable Housing : Shots - Health News These days hospitals are looking for ways to improve health in their communities to prevent illness and control costs. One hospital in Ohio decided that health might start with affordable housing. 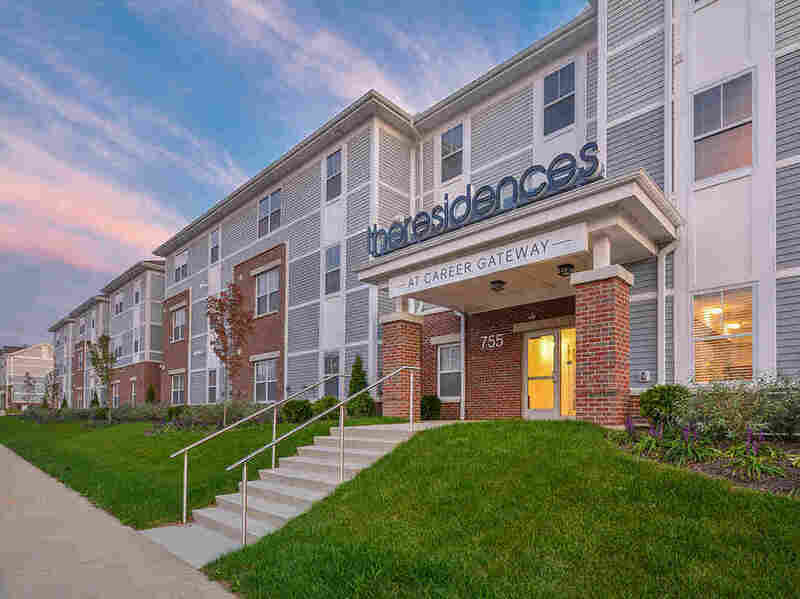 Nationwide Children's Hospital developed Career Gateway Homes, a combination low-income housing project and employment-training center. But things began to change in 2008. Nationwide Children's Hospital, located in Southern Orchards, began to invest in the neighborhood's homes. "Most were in such bad repair," says Doody, a 62-year-old fraud investigator. "But they came in and they worked within those homes and they didn't tear them down." The hospital's initiative was called Healthy Neighborhoods Healthy Families (HNHF). In partnership with the city and community groups like the United Way and a local Methodist congregation, HNHF renovated vacant homes for resale, built new affordable housing, and wrote checks to homeowners to fund renovations on their homes. An article summarizing the project's activities appeared in August in the journal Pediatrics. But why is a hospital getting into the housing business? A body of evidence points to a link between living in areas of concentrated poverty and health. It's something doctors at Nationwide Children's were seeing first-hand. Houses renovated by the redevelopment project lead by Nationwide Children's Hospital in Columbus, Ohio. "It's remarkably frustrating as a physician to see patients over and over and over again from these very high-risk communities," says Dr. Kelly Kelleher, director of the Center for Innovation in Pediatric Practice at Nationwide Children's Hospital. "Houses that are falling apart, plumbing problems, mold, rat infestations, violence. You see 25 kids a day, and maybe two-thirds of them are in these desperate straits." The impact on kids goes beyond toxic living conditions like mold and lead, Kelleher says. The stress of living with violence and trauma, racial segregation, and unstable living conditions leads to something researchers call "the neighborhood effect." "Children are affected by their neighborhood," Kelleher says. "Kids get trapped inside their apartments, there's a lot of violence outside, and they watch TV all the time. They overeat. They have asthma." By providing children safe and stable housing, and reducing blight in the neighborhood, Kelleher says the hospital hopes to help prevent many health conditions caused by harmful physical and socio-economic environments. Essentially, Kelleher notes in the Pediatrics article, they are treating "the neighborhood as a patient." Columbus isn't alone in its community-based approach to healthcare. "This is a national trend," says Jason Corburn, professor of city and regional planning at the University of California, Berkeley. "It's happening in cities across the country." Corburn points to similar projects in Seattle, Boston, Atlanta, and New York, among others. But Dr. Megan Sandel, who helps direct a housing initiative at Boston Medical Center and has provided consultation to HNHF, says that the Columbus model is exceptional in one way. "This is one model where a hospital is literally owning and operating housing in partnership with other housing entities," says Sandel. She says Boston Medical Center supports housing initiatives but they are owned and operated by other community organizations. In Columbus, the hospital-led partnership built 58 affordable housing units, renovated 71 homes, built 15 new homes, and gave out 149 home improvement grants between 2008 and 2018. With additional grants, it also built a 58-unit housing development combined with office space. Hospitals may be motivated to invest in community projects like housing because of changes in Medicaid reimbursement, says Sandel. The traditional fee-for-service model, where hospitals are reimbursed for each procedure, is losing popularity, Sandel says. Instead, states are starting to give health organizations "a lump sum of money to manage someone in a population." This incentivizes them to invest in preventive care. And one way to invest in preventive care is to give patients a healthy place to live. Nationwide Children's Hospital runs an accountable care organization (ACO) that covers 300,000 of Ohio's children on Medicaid. An accountable care organization is reimbursed for each patient under its program, not for each service it delivers. Tim Robinson, chief financial officer for Nationwide Children's Hospital, says that everyone benefits from this arrangements. "We very much see it as a win-win," Robinson says. "It's a more efficient, better aligned model." According to Robinson, these arrangements improve patient health and the profitability of hospitals and insurers, while decreasing state Medicaid expenditures. He cites a 2015 paper which showed that per-patient expenditures increased 85 percent more slowly when the patient was enrolled in an ACO as opposed to a traditional fee-for-service model. Kelleher gives another reason for the recent interest by hospitals in housing. "Hospitals are now required as part of the Affordable Care Act to do a Community Health Needs Assessment, and to try and respond to that," Kelleher says, referring to language in the health law that requires non-profit hospitals to identify and address the root causes of health problems in the communities they serve. The HNHF project in Columbus has cost more than $22 million in Southern Orchards, according to the Pediatrics report. Children's National's share of that investment was $6.6 million. But Kelleher and Sandel believe the investment will pay for itself if it reduces the number of hospital visits from members of the Southern Orchards community. "If we are able to show these improvements [in health] and reductions in utilization, it will be a financial benefit," Kelleher says. He points to several metrics that are already moving in a positive direction. "The number of murders has gone down in our neighborhood dramatically," Kelleher says. "It used to be a very big problem. High school graduation rate has also gone up." "We are also looking at the number of emergency room visits, inpatient days, and the specific types of problems children present to the hospital," Kelleher adds, but he says that it may take longer for these metrics to show signs of improvement. Southern Orchards' resident Doody says he already sees positive changes in the neighborhood. "Before, people would not walk. They would drive three blocks to go somewhere for fear of being mugged," Doody says. "Now I see couples, families, dogs out casually walking through the streets till 11 o'clock at night." "It has generally become a more family friendly place over the past decade or two," Doody adds. Still, he worries the project could lead to gentrification pushing out some residents..
Kelleher acknowledges the concern about gentrification, but says that since the hospital controls much of the housing, they can also limit price inflation, in partnership with the community. Many of the units owned by HNHF, for instance, are cost-controlled and only available to low-income renters, Kelleher says. "What we're aiming for is a mixed-income sustainable community," Kelleher says. "We are monitoring the proportion of Medicaid births, which is a proxy for low income families living in our census tracts. So far, they show no real decline." Corburn is optimistic about the project's success, but notes that it is trying to reverse several generations of economic disparities, partly caused by racially-motivated redlining, the widespread denial of home loans and other financial services in predominantly African-American neighborhoods. Results, Corburn says, shouldn't be expected overnight. "80 plus years of divestment in housing and other services is not going to be turned around by eight years of affordable housing, job creation, and other community benefit work," he says.